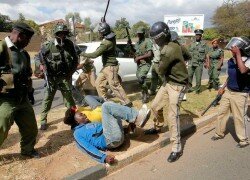 THE media and individuals proposing violence in the event that the opposition loses the August 11, 2016, elections should be prosecuted, Evangelical Youth Alliance International (EYAI) president Rev Moses Lungu has said. Rev Lungu said the Inspector General of Police Kakoma Kanganja should warn proprietors of some media houses who were promoting violence ahead of the general elections. Meanwhile, Rev Lungu has alleged that individuals and politicians who were opposing the printing of ballot papers in Dubai have connived with retired Electoral Commission of Zambia (ECZ) officers to rig this year’s elections by insisting that the ballot papers be printed in South Africa. Rev Lungu was responding to media reports suggesting that there would be anarchy in the country if opposition political parties lose this year’s general elections. “I want to inform the nation that insistence by opposition political parties to have the ballot papers printed in South Africa is because some formers workers of ECZ have connived with the opposition to rig elections by having the papers printed in South Africa,” Rev Lungu said. Rev Lungu said the decision by the commission to have the ballot papers printed in Dubai was commendable. He said former ECZ officials who have since retired once worked with some characters in the past by printing ballot papers and now the same people have been engaged by a named opposition political party to try and rig the elections. Rev Lungu said the printing of ballot papers in Dubai had nothing to do with rigging of elections. “We have security personnel who will not sit down and watch politicians cause chaos in the country,” he said. He said the UPND should be asking Zambians to vote for them and not issuing unfounded threats.